Hi Everyone! Welcome back and if you’re a new listener thank you for checking us out! Just an announcement that we’re taking an episode break because of the holidays. So there will be no December 15th episode. But…. …In January, in celebration of the release of Season 5 of Downton Abbey in the US and Canada, we will be holding a Downton Trivia contest! The trivia questions will be from Seasons 1-4 of Downton Abbey and will span all of our social media outlets; Ravelry, Twitter, Instagram and Facebook! So if you’re not joined up, you should probably do so! THERE WILL BE PRIZES!! AWESOME PRIZES!! We have had generous donations from Canon Hand Dyes and The Vintage Rose and they are so, so wonderful! Please be sure to visit these shops, because they are wonderful and we can’t guarantee Katy won’t run away to Mexico with the prizes! They’re that good!!! 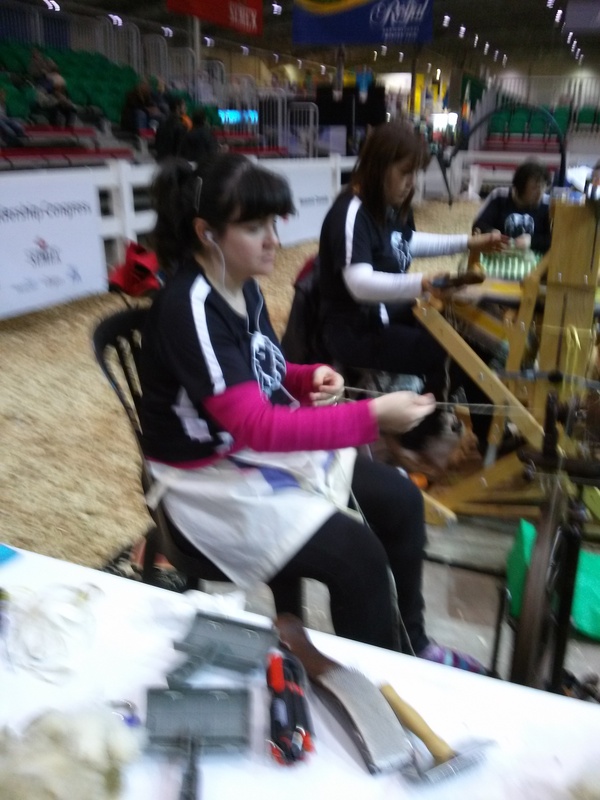 Katy attended on November 16th with Agents of Sheep to compete in the Sheep to Shawl competition. It was a total blast even though we were all up at the crack of dawn! 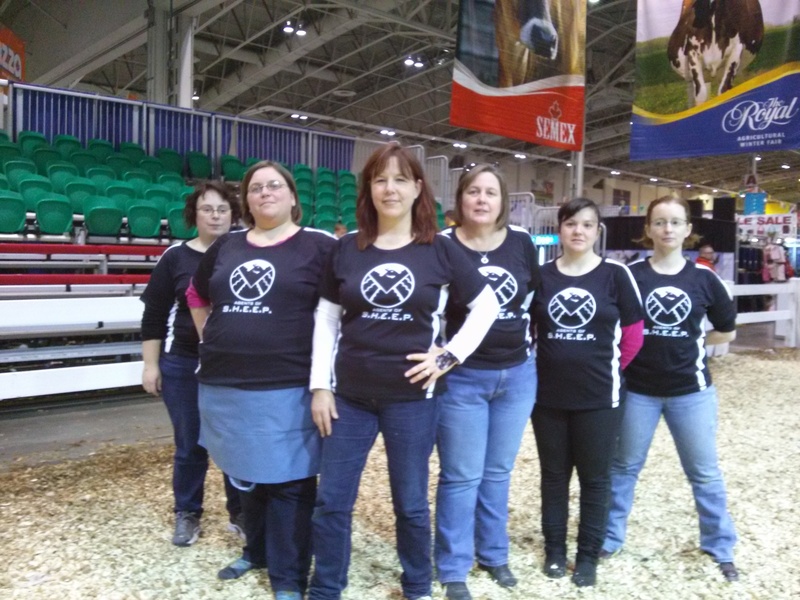 We got in the groove and this was our first time as a team competing in the Sheep to Shawl Competition. 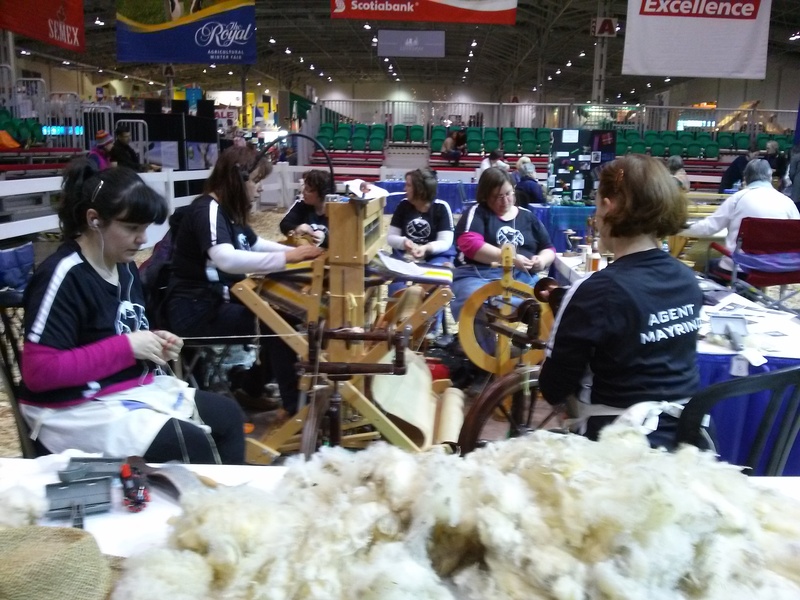 After 4 long hours spinning, plying and weaving… our team gathered in the East Annex to find out how we did! And…. WE CAME IN 5TH our of 9 teams!!! Which is a really good debut and we were all very pleased. 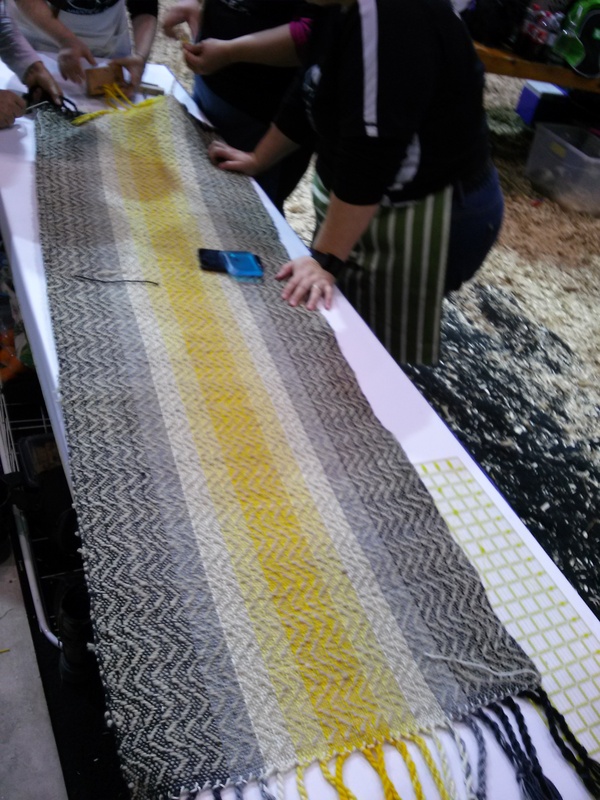 Our shawl (theme was Out of the Darkness and Into the Light) sold at auction for $100 too! Our team photo afterwards was sent to Clark Gregg (Agent Coulson from the Marvel Universe) and he had retweeted our photo, which was a pretty cool cherry on top! We can’t wait till next year!! We have our Loved Ones KAL and also our Corner to Corner crochet afghan CAL going on till the end of the year. They may be extended or they may just fizzle out. But we hope, if you participated, that you had fun. Let us know in our Ravelry group what you’d like to do in the future. Valerie finished a pair of Pixie Slipper Sox with a pom pom on each foot for a family member for Christmas in the two shades of brown she described in Episode 12. 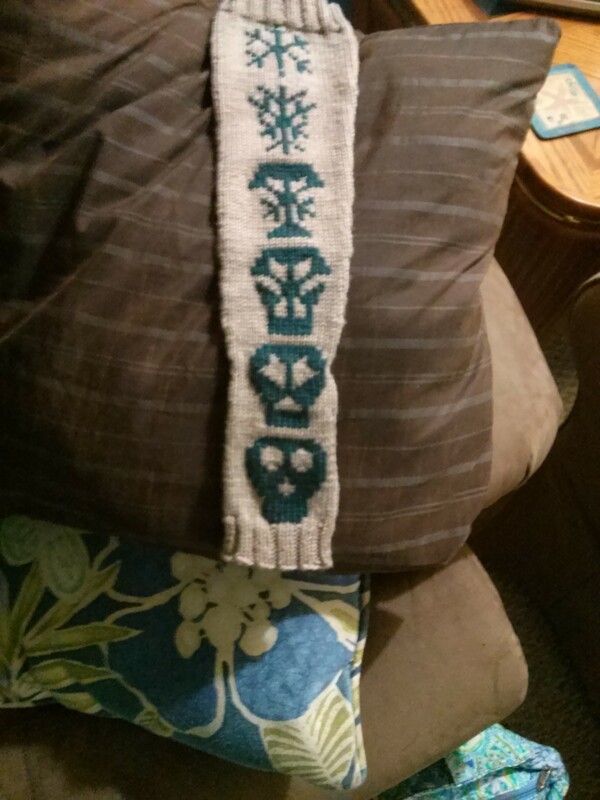 Katy finished one of the ‘Snowball’s Chance in Hell’ mitts and is waiting till December to cast on the second one because she’s working on some Christmas gifts. Valerie is working on a pair of pixie slipper sox in Grape Fizz and Amethyst Red Heart Super Saver for someone special as a surprise Christmas present. As well as some fun various and assorted dishcloths that she can have ready for last-minute gifts. Katy is working on a gift for her mom (details after the holidays cause Mom listens 😉 ). She’s also almost done the Elsa and Anna socks from Must Stash Yarns in the sport sock base. 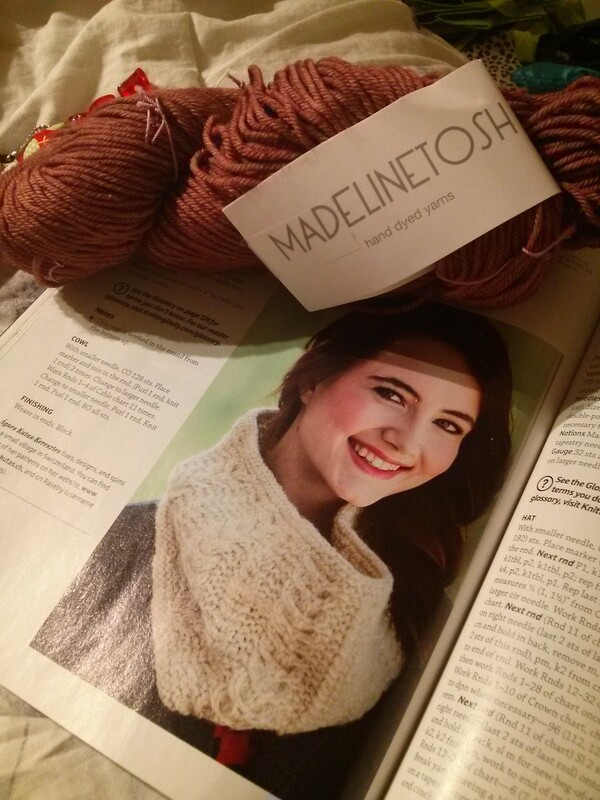 And, if that’s not enough, she cast on the Fairbanks Cowl in Madelinetosh Tosh DK in the colourway ‘Isadora’ for her mother-in-law. She had the yarn in her stash too so, shopping from stash for the win! Katy needs sleep and more time to knit her gifts. Valerie needs socks and underwear from Santa!! Valerie wants a bottle of Hypnotic Poison by Dior and Katy wants LUSH bath products…and a relaxing bath. Valerie learned about Perfumed Court; a perfume/fragrance decanting site highly recommended by twitter friend. Katy learned that coffee is her friend! Katy wants to do more spinning and Valerie wants to bake Christmas Cookies! Val picked up two skeins of Red Heart Super Saver yarn at Walmart and another pair of needles. The colourways that caught her eye were Grape Fizz and Candy Print. 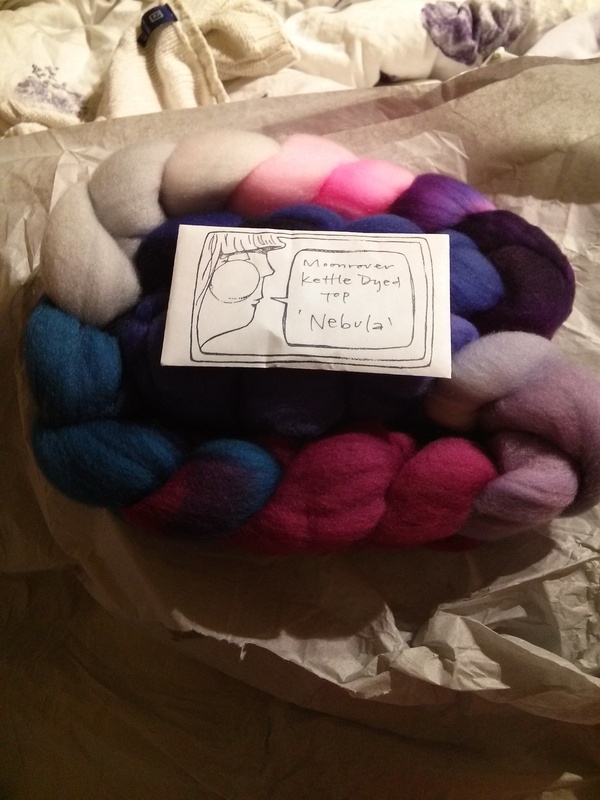 Katy was enabled by The Minerva Turkey Knits podcast to pick up a braid of Moonrover Yarnsfibre in the colourway ‘Nebula’ it’s gorgeous!!! And she didn’t break her ‘yarn’ diet either… cause this was fibre!! Katy’s mon also purchased the Interweave Knits Gift issue where she found the pattern for the Fairbanks Cowl that she’s knitting for her mother-in-law! Lots of pretty hats too, a shawl with 2 sizes, a little girl’s tea party and lots of cool fun things to knit for gifts! 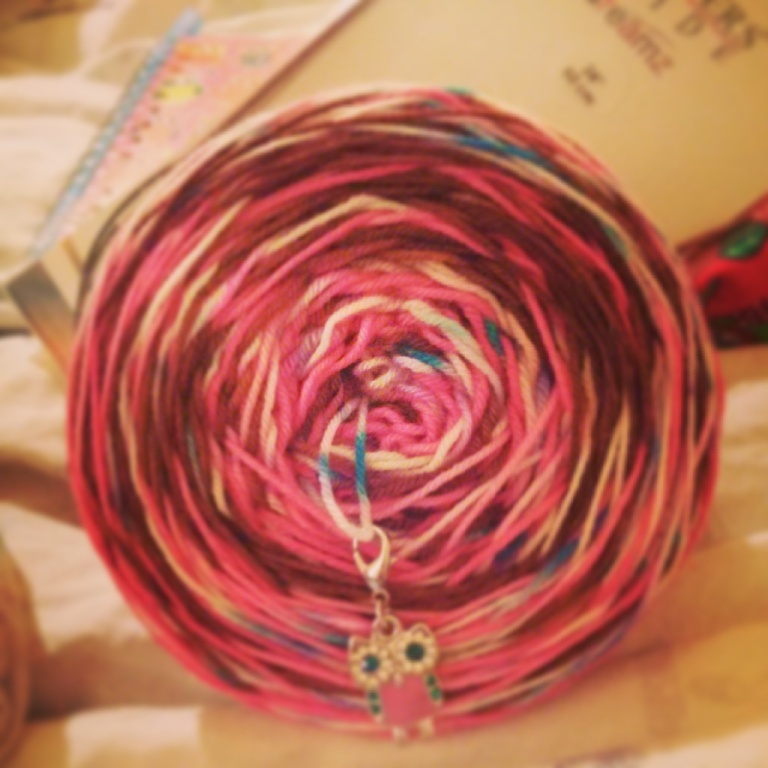 You Had Us at Yarn… and Patterns… and Podcasts! Val went and logged on to and found two great colourways that she wants! The First is ‘Under the Tree’ which is lovely Christmas colours as if you were lying under your tree and looking up at all the pretty lights, ornaments and tinsel… and you can get that one in her Sparkle Gnome base so you actually can have tinsel in your yarn! And the other is ‘Eddie Griswold’, which of course is a character from National Lampoon’s Christmas Vacation, which is a favourite of ours at Christmas. The yarn is white, brown and leisure suit blue! Perfect! Katy discovered a new-to-her knitting podcast called Dancing Geek Podcast on Youtube! His name is James, he lives in the UK and he’s adorable! Check him out if you have the chance. She also discovered that Knitsomniac Design on Etsy is carrying pretty tweed sock and dk yarn in the colourways “SherLOCKed” and “Tardis” … her geeky little heart yearns for them. Christmas Lights on Ravelry – crochet your own string of pretty Christmas lights! Christmas Characters Amigurumi ornaments – Super cute for the tree this year, or stocking stuffers for a friend! Here are a couple special mentions for the knitter on your Christmas Gift list! Tiny Rudolph – this tiny little guy is premade with clay antlers! You can also request to get a key fob on him for your keys! Yarn Texture Smartphone Case – get this for your tech-savvy knitter and they’ll be happy all year! We’re both also watching Tudor Monastery Farm on TV Ontario (TVO) and are loving it! 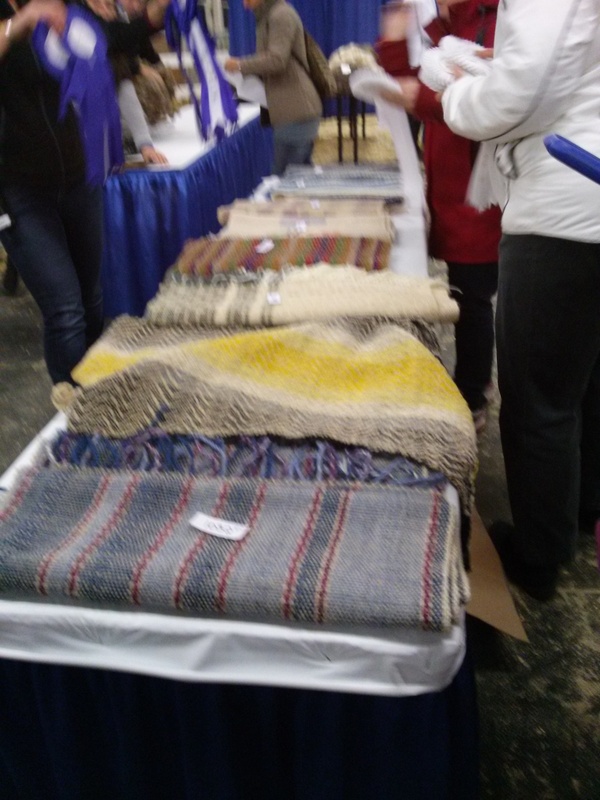 We love the farm shows and this is the same group of people who made the Victorian and Edwardian Farm series. AND!!!! We both watched the Season 5 finale of Downton Abbey online and we won’t give too much away but … Rose is gorgeous and is lucky to have such a wonderful father, Robert made us cry with his admissions and discoveries and his actions for Mrs. Patmore, and…OMG ANNA!!! That’s all we’re gonna say! 😉 Tune in to Season 5 in January and come back for our Downton Trivia contest and you can chat all you want about it in our Downton Chat Thread on our Ravelry group!!! So we were discussing whether items made with a knitting machine or loom are less ‘handmade’ than ones knit by needle or hook. Valerie and I are in agreement that if you make the time to craft something for someone, even if you use a knitting machine or loom, that it doesn’t make it any less handmade. Especially if you can’t use your hands because of an injury or arthritis. We hope you enjoyed this episode and we hope you all have a lovely Christmas, Hannukah, Kwanzaa and a Happy New Year if we don’t release our next episode until January 1st! Everyone be safe and have a wonderful Holiday! As always, itunes reviews and star ratings are much appreciated and please come and join us in our Ravelry Group for our KAL/CALs, contests and just plain good ol’ conversation. Take care and have a good fortnight everyone!!! « Episode 12: Horrible Teases!